CURRENTLY READING: All of my reading lately has been on the non-fiction tip. The last fiction I’ve read was a slog of a collection that I haven’t finished yet. (It has some incredible craftsmanship, but damn if most of the stories just don’t do it for me.) Anyway, what HAVE I been reading? I’ve made it into the Dark Horse years of AMERICAN SPLENDOR. I’m about halfway through NOTHIN’ BUT BLUE SKIES: THE HEYDAY, HARD TIMES, AND HOPES OF AMERICA’S INDUSTRIAL HEARTLAND by Eric McClelland which I discovered while perusing BELT MAGAZINE’s website. And lest you think I’m just now jumping on the whole “Rust Belt Chic” bandwagon, I’ll just say that I grew up during most of the stuff in Chapter 4 of BLUE SKIES (i.e. the Cleveland chapter). It’s been enlightening nonetheless to look at the historical context of my early life. 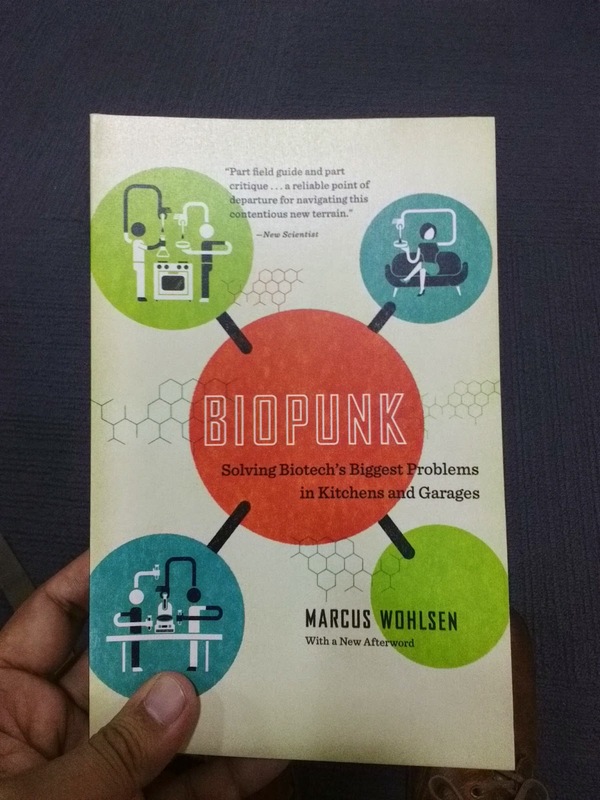 And, I just picked up BIOPUNK: SOLVING BIOTECH’S BIGGEST PROBLEMS IN KITCHENS AND GARAGES the other day at a bookstore discount table for $4, because there just has to be a story in here somewhere. BACKYARD FRACKING: Something I forgot to mention when I wrote up having seen the short documentary BACKYARD at FLEFF. During the Q&A with the filmmaker, someone asked if she attempted to get any comments from the fracking industry. She says she did, and that it was rather easy to. She was granted tours through various rigs — sans her camera crew — and interviewed workers who apparently only had the same pro-fracking talking points. She reported being unable to find anyone with a unique pro-fracking story, which she attributes to the industry’s powerful propaganda machine. Power that was corroborated by an audience member with an account of the presence of energy companies in the independent film business and festival circuit. Know thy enemy and co-opt. Basic, really. FILIPINO RONDALLA: Of course they’d have a Filipino Rondalla group at the Ivy League for which I work. To paraphrase the motto, “Any person, any extracurricular activity,” apparently. It brought back some childhood memories of my first visit to the Philippines when I was about four. I remember a candle dance and a tinikling demo, just like what I saw at the group’s concert last Saturday. That said, I have to acknowledge that this student display of Filipino culture–the culture of my parents–isn’t the culture of everyone in the Philippines. I fear for the non-Filipino audience members who may have left feeling armed with a proper overview of “Filipino culture”, and then trying to share this knowledge with, say, someone from the Visayas or Mindanao. They may not be received well. After all, Filipinos have stabbed people for far less…. Next time, I’ll probably talk about the lung pox I’m fighting. My issue was that, with exceptions, my general reading experience was that of being told. Yes, I realize that may even have been the point. Heck, in the story “We Were Wonder Scouts,” we’re told a story which has a scene in which a secondary character tells a story. But the approach is double-edged. There’s no question Ludwigsen has mad storytelling skills. But I didn’t always feel the sort of tension I like to feel in short-short stories. The exceptions really touch me, though. “Mom in the Misted Lands” had such a poignancy in its telling and in its theme. “The Ghost Factory” hit a different spot, giving me a (pleasantly!) sickening “There, but for the grace…” feeling. The book almost defies your expectations of a prequel for The Incal. Still, you get the origins of pathetic Class “R” detective John DiFool, you see the byzantine and surreal chain of events that push him directly to his role in that story, and you see in the last chapter–which I personally could’ve done without–wherein Jodo feels the need to show every other character in The Incal and how they’re positioned to take up their roles in that book. But that doesn’t take away from how brilliantly the Jodoverse was fleshed out by Zoran Janjetov in true Moebius-like fashion. And while this story is a significantly lighter on spiritual concepts than The Incal, Jodo does a great job highlighting the existential and practical suffering of a world which lacks the spiritual. The writing in this collection of flash pieces captured me. I got so caught up in the moment by the oft-times brutal economy of language, of the images of despair, ferocity, hope, and survival that I was pretty breathless by the time I was done with it. So much so that when I try to sit down and wrote about the collection in aggregate, I feel like I somehow missed the forest for the trees and so I’d reopen the book, go back over a few pieces, only to find myself breathless again. I’ve done this three or four times now, so here, 5 out of 5 already! I first sought out Barry’s comics years ago because Filipina! Okay, part-Filipina but enough to hook me with a panel of an elderly woman, sitting on a couch with one elbow resting on her raised knee, declaring “Ay, nako!” But Syllabus was my first encounter with one of Barry’s artistic how-to books. It’s a compilation of syllabi, courses, and exercises she’s used in the various classes she teaches at the University of Wisconsin-Madison. Syllabus gets 5 stars because after a mere two weeks, the exercises within–more or less in practice; definitely in principle–have already yielded dividends as far as filling some of the gaps in my writing practice that I’ve been struggling with since the day I started. I can feel the techniques reshaping my artistic process the way I used to feel muscles being shaped while working out (another experience I haven’t had in awhile), and it feels great! A good number of pieces here actually didn’t hit me the way I like flash stories to hit me. Possibly I’m a little inured to that these days. And yet when I considered each piece and what I took away, I discovered a few stories with layers of subtlety. Yes, I realize not every piece of flash fiction has to slap me in the face to be effective. And yet, it was a little difficult for me to distinguish some of the slower-burning pieces with pieces that only fit the flash rubric in terms of minimal word count. Those latter pieces might be complete stories, but they could’ve been told–might as well have been told–in two or three or five thousand words. There were gems from some of “the usual suspects” in flash fiction that I like to read: Bruce Holland Rogers, Tara Masih, Sherrie Flick, Tom Hazuka, et al. But my joy at reading those stories was tempered by the ones that didn’t impress so much. I’m rating this 4 stars, but it’s really closer to 3.6 for me. An opinion about a book of 30 microessays and 30 flash fiction stories shouldn’t be very long. The essay half is on writing; it’s now in my top 5 of writing resources. Not every flash tale resonated with me but “Unfriendly Cashiers” is any indication, each story holds a grain of real truth. Pure impulse buy at my local comics shop. I’ve been on a Jodorowsky kick lately (I’m working my way through his films and have already read The Incal and some of The Metabarons) so this shouldn’t surprise anyone. The first graphic novel collaboration between Jodo and Mœbius gives us twenty-four full page illustrations with minimal dialogue, as part of Jodo’s attempt to do something unconventional while trying to subvert commercial constraints. (He says as much in his introduction to this 2013 edition.) While the story is short enough to warrant grumblings about the collection being overpriced, it has everything you’d expect from any Jodorowsky/Mœbius tale in Métal Hurlant magazine: surrealistic sci-fi illustrated by a master. On top of that… again, we’re talking about full page Mœbius here, so while the collection could’ve (should’ve?) been cheaper, I was happy to pay what I paid. There’s no way a reader and writer like me was going to pass up a story collection from someone whose work appears in The New Yorker, The Antioch Review, decomP, Monkeybicycle, PANK, et al., and whose book is blurbed by Ray Bradbury and Gary K. Wolfe! I get the accusations about the book being “gimmicky”. I get that some readers require characters to have things like names other than The Man, The Woman, or The Octopus. I get that the structure of these stories can seem repetitive. While the language, characterization, and descriptions of setting are stripped-down, it’s done so strategically. There’s still enough sense of character and place for relatively whole stories. Stories that are as instructive as any fable, complete with a moral–but which are as subject to interpretation as any myth. I know some writers and critics in speculative fiction for whom this would absolutely stick in their craw. And some of those folks intersect with those I know who don’t much enjoy short stories, let alone short-short fiction. They tend not to be people I drink with, anyway. This review is probably biased. I’ve been a fan of Rickert’s writing for almost a decade. As far as I know, I’ve read her entire published oeuvre, and have gone on record talking about how much I love it. I even had the pleasure of telling her face to face a few weeks ago! A lot of Rickert’s shorter work is often populated by the walking wounded. Characters who are often terribly aware of whatever darkness (some kind of guilt, trauma, tragedy, maybe some secret) pervades their lives. It often isolates them, as those who might share that grief–well-meaning lovers, family, community–move on. And while sometimes (not every time) I’m left with a sense of a character’s transformation, of some tiny newfound strength or hope in the future, I would fear what tomorrow could bring them. The difference in Rickert’s debut novel The Memory Garden, is that Nan and her friends Mavis and Ruthie made it through to the other side of their darkness. They lived past a shared tragedy some sixty years into old age. Not unscathed, of course. The damage to their lives is done, and they drift apart. But one way or the other and with varying degrees of success, they each soldiered on to eventually move into and through their own individual guilts and traumas–and occasional blessings, too. Nan was given the care of Bay, an unexpected, maybe even undeserved miracle. And Nan chooses to raise Bay, even if it meant doing so in the shadows of everything that came before. Even if it meant more secrets. It’s the sort of situation one falls into once life becomes about more than survival. The Memory Garden‘s peculiar cast of characters gathered under even more peculiar circumstances shows us what any of Rickert’s short story characters’ lives might be like sixty years after a given tale, about a time when the past will, despite whatever life you might have lived in the interim and whatever you’ve done to put distance between you and it, demand to be reckoned with. And this is, at least as far as my memory of Rickert’s other work goes, fresh ground.